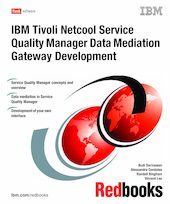 This IBM® Redbooks® publication discusses IBM Tivoli® Netcool® Service Quality Manager V4.1.1 data mediation development. It is aimed at implementers and system integrators connecting new data sources that will be managed by Service Quality Manager. Data mediation in Service Quality Manager is performed by Perl gateways. Gateways extract data from vendor specific hardware monitors and prepare the data to be loaded into the Service Quality Manager application. The development aspect of data mediation for gateways uses Perl extensively. The control files or rules are written as Perl subroutines. We discuss the detailed specifications and processing of these mediation rules.